As easy as credit cards for your customers, at a fraction of the cost to you. Anyone with a bank account can pay you with eChecks, for a micro fixed-fee that could save you thousands on transaction costs. Paper checks are quickly becoming a thing of the past, but online credit card payments aren't a good fit for most businesses, due to the high transaction fees. eChecks are a more affordable alternative to credit cards, faster than paper checks, and allow you to automate your billing process with recurring charges. Not all eCheck offerings are the same: only PayStand gives you everything you need to accept eChecks alongside credit cards, in a single checkout with instant funds verification. 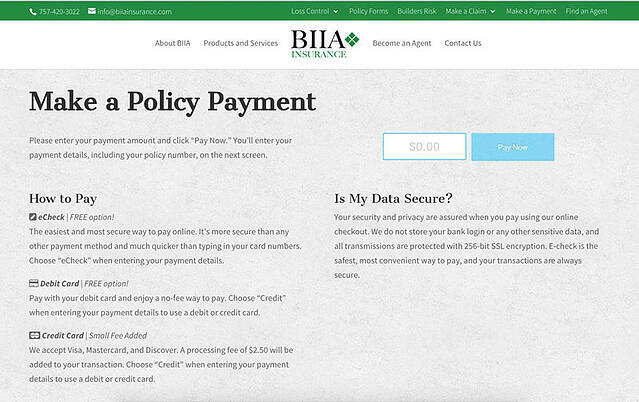 With PayStand's drop-in payment gateway, BIIA Insurance was able to start accepting eChecks on their website within a week. Today, they are saving thousands of dollars per month on unnecessary transaction fees, and their customers appreciate the convenience of paying online. What you don't know about payment methods can end up costing you. Learn the ins and outs of ACH and eCheck transactions, how to accept them online, and how to steer your customers to more affordable online payments. 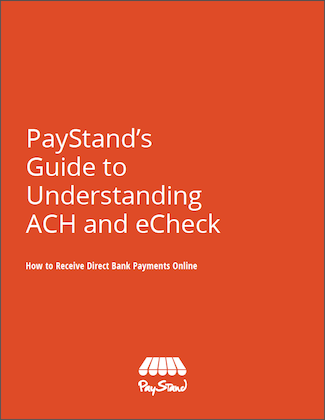 Get your free PayStand Guide to Understanding ACH and eCheck today. Why should I accept eChecks instead of credit or debit cards? eChecks are gaining in popularity because they can be processed for a fraction of the fees taken by credit card payments (see below). They provide an easy and secure way to get paid directly from a customer’s bank account, and make a lot of sense for big-ticket or subscription-based items. What does it cost to accept eChecks? PayStand subscribers at all membership levels can accept eChecks simply by turning on the eCheck option in their dashboard. PayStand does not mark up eChecks, so you'll get a permanent 0% rate with a micro fixed processing fee. Which banks are supported for online banking login? PayStand has partnered with major U.S. banks including Bank of America, Wells Fargo, Citi, Chase, and US Bank, among others. We support 90% of U.S. banks, which allow us to connect with their secure online banking portals to authorize direct debit transactions. Does my customer have to sign up with PayStand to pay me? No, we try to make your customer’s payment experience as seamless and easy as possible. Your customer can pay right on your website in an inline checkout window, complete with your logo and branding. They don’t need any special credentials other than their banking login to authorize the transaction. Does my customer need their checkbook handy to pay with eCheck? No, because PayStand supports secure online banking verification, all your customer needs is their bank login to approve the transaction. Most people have their bank logins memorized, which makes it a more convenient payment method than entering in all those credit card digits and security codes. Can I accept international payments by eCheck? At this time PayStand does not support international eCheck payments. We do support international credit card payments as long as the merchant account is U.S.-based. How can I request an eCheck payment? PayStand gives you several options to guide your customer to an eCheck payment. You can send your customer a secure link to pay you for a specific invoice, or include eCheck as an option in your online checkout process. You can include eCheck next to the credit card option, or offer eCheck exclusively. Can I discount eCheck transactions? Yes. You can offer an incentive to your customers to pay with eCheck as opposed to credit cards by adding the credit card fees to their transaction totals. 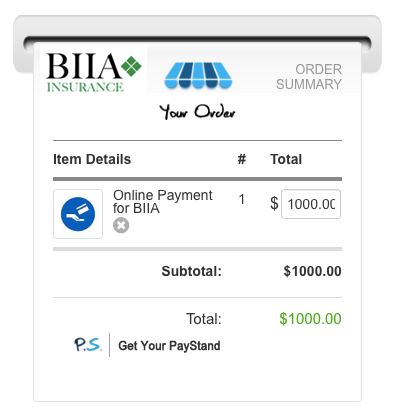 The PayStand checkout will automatically calculate and display the amount they will save by paying with eCheck. How can I ensure my customers’ privacy when they pay with eCheck? 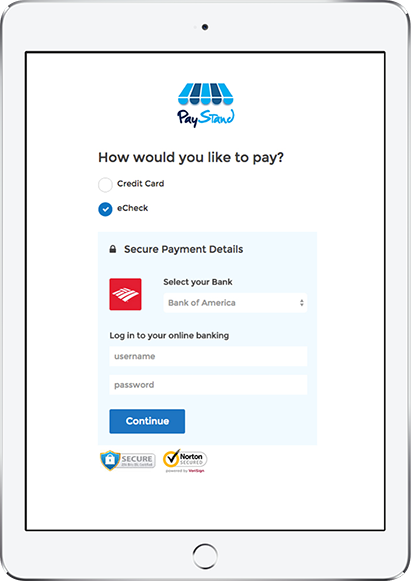 Your customers’ security and privacy are assured when they pay you with PayStand’s eCheck checkout. PayStand does not store your customers’ bank login or any other sensitive data, and all transmissions are protected with 256-bit SSL encryption. Since PayStand does not store this information, it is never in your possession as the merchant, freeing you from the risk of hacking or accidental disclosure. Can I set up automated debits with eCheck? Yes, automated recurring eCheck payments are a unique feature of PayStand’s eCheck support. You can set up the recurring payment option when you turn on eCheck payments in the PayStand dashboard to monthly or annual. Only the fixed fee will be charged for each transaction. Recurring eChecks are a great way to receive regular payments on time and in full, as well as to offer amortized payments for big-ticket items or donations. Can my customer fake an eCheck transaction? No. PayStand eCheck transactions perform instant funds verification on the source bank account before confirming the payment. Only the owner of the online banking login can authorize and perform the transaction. The eCheck system is the culmination of over twenty years of collaboration between the U.S. government, banks, tech companies and other stakeholders to enable check payments to function securely on the Internet. It is designed for businesses of all sizes, including individuals, to perform direct bank debits digitally within the well-established checking infrastructure. ACH, or Automated Clearinghouse, is a separate system that was developed in the 1970s to facilitate high-volume money transfers between trusted parties. It is most commonly used for applications like direct deposit payroll and automated loan payments. Because ACH enables both debits and credits, it requires an elaborate legal framework and high degree of trust between parties, which has limited its usefulness as an online payment method. eCheck enables secure, one-off or recurring direct bank payments that don’t necessitate a blanket authorization between trusted parties to function. Because eCheck works between banks without unnecessary middlemen, they also carry lower fees than ACH.The eCheck system was architected to exceed even the high standards for online credit card processing. It leverages state-of-the-art cryptography and digital signatures to ensure the validity of each transaction. The eCheck framework is further protected by the long-established legal structure around checks. Because eCheck payments are initiated by the customer, they show a clear authorization and intent to pay instantly, therefore dramatically reducing the refund and chargeback requests commonly associated with credit card charges. Can I give my customer the choice of eCheck or credit card? Sure, PayStand lets you offer eCheck as an option next to credit cards, so your customer can choose. You can even offer a discount for eCheck payments, to pass the savings on fees to them. Can I process paper checks with eCheck? Yes! PayStand’s mobile app lets you use your iPhone to take a picture of a paper check and process it as an eCheck. The PayStand app will perform instant funds verification so you can confidently accept a customer’s check and deliver your merchandise or service. Even better, PayStand will deposit the funds for you and save you a trip to the bank. Can I integrate PayStand’s eCheck functionality? Yes, PayStand offers enterprise-level solutions to allow developers to integrate eCheck with their platforms. eCheck has broad applications for funds transfer, deposit and remittances, and PayStand offers a rich API so you can customize our implementation to suit your business. We also offer quickly deployable plug-ins for popular eCommerce and web development environments.